References to Tiananmen Square are becoming increasingly difficult for Beijing to suppress. On Sunday, two days before the 24th anniversary of the Tiananmen Square crackdown, ex-mayor of Beijing Chen Xitong died at 82. While Chen’s death is news in itself, the more significant point to note is that the man behind the bloody suppression of the student-led movement later came to confess that he regretted the incident, immortalized in the heroic “Tank Man” video, which remains resolutely banned, along with his photograph, in China to this day. Although Chen once stood atop the Chinese pyramid of leadership – being promoted at one time to the post of Beijing Party Secretary – he fell dramatically on charges of corruption in 1995. Chen remains one of China’s top officials to be jailed for corruption, alongside Bo Xilai and Chen Liangyu, notes the South China Morning Post. Chen was silenced with a 16-year prison sentence in 1998, but he expressed his change of heart regarding Tiananmen later in life after being released from prison on parole due to his deteriorating health. The comments would have been lost were it not for a book published in Hong Kong last year by retired scholar Yao Jianfu, who interviewed Chen in his last days. Alongside expressing remorse for the event, Chen also denied direct responsibility for the incident and said he called for an investigation into the crackdown. 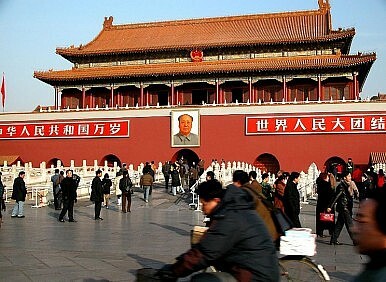 News of Chen’s death was a tricky matter for Beijing, which continues to vigorously suppress all mention of the event. In Hong Kong, however, where the democracy debate is raging, police estimated more than 50,000 local residents held a solemn candlelight vigil yesterday in a large park in the former British colony – the only such event to take place in China. Although Beijing has promised to allow Hong Kong to elect its own leader by 2017, since the handover from British to Chinese rule in 1997 the yearly June 4 ceremony has increasingly served two functions. On the one hand, it commemorates the event at Tiananmen Square (often described as a “massacre”). On the other, it serves as a collective statement of disaffection with Beijing’s rule. Indeed, this year’s vigil in Hong Kong came under attack on the Internet due to its slogan “Loving the country, loving the people”, highlighting the growing rift between the city and the rest of the country. This gap is extending to mainlanders as well, as reflected in the blogosphere. This week on Weibo wily bloggers launched a “yellow duck” meme – inspired by the recent inflatable art piece seen plying the waters of Hong Kong’s Victoria Harbour – that replaces the tanks of the original “Tank Man” image with cute yellow ducks. Others replaced both the man and tanks with Lego equivalents; or with bulldozers inching towards a steadfast cow. One went as far as pitting a praying mantis – seemingly waving its arms – against the tire of car. Authorities responded in typical June 4 fashion, adding “big yellow duck” to its list of banned words on the Internet, along with others like “candlelight”, “tank”, and all manner of numerical combinations meant to refer to the date of the incident (“six four”, “eight nine”, et al). Weibo users fired metaphors alluding to the event back and forth throughout the days leading up to June 4 and spoke in code. But all understood. Referring to the censors’ Sisyphean task of keeping up with banning all potential iterations that could reference the event, one Weibo user quipped, “… some people are very busy today”. Hong Kong residents, bloggers and dissidents on the mainland are not the only ones who think the time has come for Beijing to come clean on the matter. Last Friday, the U.S. State Department said in a statement that the "violent suppression of demonstrations in Tiananmen Square" prompted it to remember this "tragic loss of innocent lives". It didn’t stop there, calling on Beijing “to protect the universal human rights of all its citizens; release those who have been wrongfully detained, prosecuted, incarcerated, forcibly disappeared or placed under house arrest; and end the ongoing harassment of human rights activists and their families." There is a mounting call for the Chinese government to come clean to its citizens about what really happened in 1989. The virtual crackdown this week and Hong’s rebuttal to the U.S. suggest there is still a way to go. While some people tried to commemorate June 4, the Chinese authorities updated censorship techniques.